Fr Mark Morris is Parish Priest of the Church of the Immaculate Heart of Mary at Balornock in Glasgow. It was in this church that Cardinal Burke celebrated a Pontifical Mass last year. 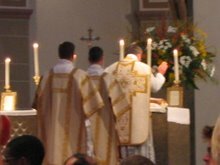 Fr Morris has attended many of the Priest and Server Training Conferences organised by the Latin Mass Society, usually bringing with him other priests and servers from Scotland. Amongst Fr Morris's duties has been that of Catholic Chaplain to Glasgow Caledonian University - or that was the case until a few days ago when he was dismissed from that position bu the University authorities. 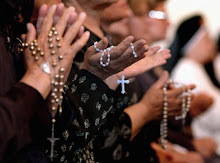 He had offered Rosary, Benediction and a Litany at his church in reparation for the "gross offence against God" caused by Glasgow Pride. It is pleasing to see that the Catholic students of Glasgow Caledonian University have reacted in a very measured but firm way saying that they were "extremely disappointed" at the move and that it was "abhorrent that a priest should be dismissed for affirming the teachings of the Catholic Church".